Sam Betts aka Dwight J Ingleburgh may not be the most recognisable names in the wrestling business he was infact one of the great grapplers of his generation. For Dwight regular work and decent pay was necessary as he and his wife, Sheila, had four children to raise, and like all parents they wanted to do the best for their youngsters.Dwight and Sheila were more determined than most parents to give their children a goodstart, because their own humble origins had instilled a value for education, a commitment to hard work and a sense of decency and honesty. doing jobs to help his parents who were by then in their late fifties, and all the usual distractions for a ten year old meant that school work was low in his priorities. Maybe that is one of the reasons Sam and Sheila were encouraged such a strong valuefor education in their children. It seems to have worked and both are justifiably very proud of the achievements of their four children, all of whom have gone into skilled professional jobs. Sam left school at fourteen. Times weren't easy in 1947 and for all the youngsters in Barnsley opportunities were limited and Sam got a job down the coal mine. Around the same time he began developing his boxing and wrestling skills at Charlie Glover's gym. In those days Charlie's gym was in Quarry Street, only moving to The Junction in 1956. Sam told us "Charlie Glover was a great man; a very hard man. Everyone in Barnsley looked up to Charlie." He worked in the mines for two years, moving to the steelworks when he was sixteen. A couple of years later Sam was on the move again, this time "called up" to the Irish Guards. Throughout his service days he was able to continue boxing and represented his regiment many times. Sam returned to Barnsley and The Junction Gym in 1956, around the time that Charlie moved his gym to behind the pub of The Junction on Doncaster Road. "It was was a small place with a fantastic atmosphere. The wrestlers trained downstairs and the boxers were upstairs." In 1957 Chancellor of the Exchequer Peter Thorneycroft abolished the Entertainment Tax, which had taken 25% of all entertainment revenue. With the stranglehold of the tax removed Charlie Glover seized the opportunity to promote wrestling, and asked Dwight to turn professional and work for him. Sam jumped at the chance to get paid for doing something he loved. Charlie Glover's son, Brian (known to wrestling fans as Leon Arras) bestowed Sam with the name Dwight J Ingleburgh of New Jersey. Sam looked the part and very quickly he established himself as a regular on the northern circuit against the likes of Karl Von Kramer, Bert Craddock, Charlie Glover, Dominic Pye and Henri Pierlot. As an established regular at the Junction Dwight also trained a number of the younger lads, including Bruno Elrington, Leon Arras and Catweazle. In 1958 promoter Jack Atherton began booking Dwight and his career, and class of opponent moved up a gear. Although not a member of Joint Promotions Jack worked in conjunction with the organisation and his shows featured both the famous names of Joint Promotion rings and up-and-coming independent wrestlers. 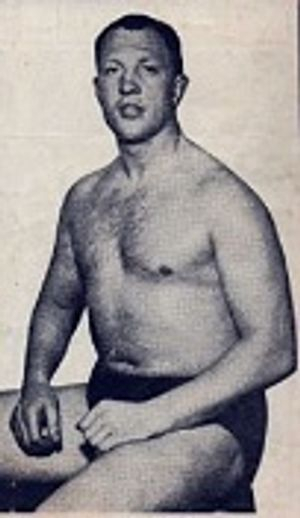 Jack Atherton gave Sam a new name, Bill Dunn, and big name opponents that included Hassan Ali Bey, Francis Sullivan, Count Bartelli, and Mike Marino. In the years following his return to Barnsley things also became more serious between Dwight and his sweetheart, Sheila Broadhead, and the two of them married on 29th October, 1960. Although Dwight's wrestling commitments were by then taking him around the country he tried to make his way home every night whenever possible. It was a hard life. It wasn't uncommon for independent wrestlers to work two or three times a day, and more than double that when working the fairground booths as Dwight and many others did during the summer month. On top of all this Dwight had a day job for most of his career, and somehow found time to build his own four bedroomed detached house! "I worked in the mines, the steel works, a plate layer on British Rail, for a steer erecting firm; always physical work. I enjoyed it, and it kept me fit." Dwight was always fortunate that his employers were understanding of his wrestling commitments and usually agreeable to him taking time off and working flexible hours. This enabled him to accept overseas work which included visits to India, Pakistan, Sweden, Singapore, Malaysia Kuwait. The visits to India and Pakistan were the highlights of Dwight's career, where he was for some reason billed as German. One of the greatest victories of all was over the great Goga Pehalwan. He also has fond memories of his two visits of Sweden, a thirty bout trip with promoter Don Robinson, and the second with Jack Taylor. Dwight had the swagger to upset the fans and he told us of one night when he did seem to irritate one ringsider. It was a match in Scarborough, for promoter Don Robinson. An irate female fan attacked Dwight with her rather large handbag. It was Bessie Braddock, MP, a keen wrestling fan who was holidaying in Scarborough. Nowadays Dwight remains active and in good health. A routine day involves working on his allotment, half an hour exercising, and chatting to friends on the telephone. 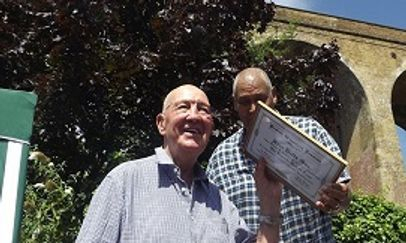 Dwight was inducted into the British Wrestlers Reunion Hall of Fame in August 2015. The above report supplied courtesy of our friends at Wrestling Heritage website.